This set of Tough Organic Chemistry Questions and Answers focuses on “Reagents in Organic Chemistry”. 1. 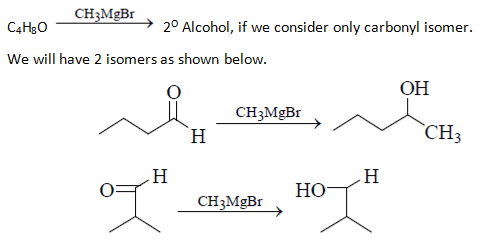 Which is the suitable catalyst for bringing out the transformation given below? Explanation: BF3 increases the electrophilicity of carbonyl carbon due to which sulphur attacks on carbonyl carbon. 2. Which of the will give effective reduction of 3-hexyne to trans-3-hexene? 3. Which of the reagent will give effective transformation of given compounds? Explanation: Ph3P = CH2 will give the most effective transformation of ketone into alkene (Wittig reaction). The Wittig reaction is a popular method for the synthesis of alkene from ketones and aldehydes. The Wittig reagent can generally tolerate carbonyl compounds containing several kinds of functional groups such as OH, OR, aromatic nitro and even ester groups. 4. Which is the mildest reducing agent which reduces only carbonyl group in presence of nitro, carboxyl, double bond and ester groups? Explanation: NaBH4 is mild reducing agent for this conversion. It is very effective for the reduction of aldehydes and ketones to alcohols. By itself, it will generally not reduce esters, carboxylic acids, or amides (although it will reduce acyl chlorides to alcohols). 5. What will be the product for the given reactant and reagents? Explanation: LiAlH4 will reduce double bond into single bond and aldehyde group into alcohol. 6. Which is the correct combination of reagent which can carry out following conversion? Explanation: Here CH3 will attack at C=O and dehydration will take pass and again water will attack at meta position as a nucleophile at the ring. PCC will covert -OH into =O. 7. How acetophenone can be converted to phenol by reaction? m-CPBA can convert ketone into amide and after ester hydrolysis it is reduced into phenol. 8. How can we prepare RR’ R” OH by the action of excess of a suitable Grignard reagent on which of the following reactants? 9. What is used to carry out the following conversion? Explanation: The transformation of a terminal or 1,2-disubstituted alkene to a ketone through the action of catalytic palladium(II), water, and a co-oxidant. Because of the ease with which terminal alkenes may be prepared and the versatility of the methyl ketone group installed by the reaction, the Wacker oxidation has been employed extensively in organic synthesis. This is followed by haloform reaction. 10. How many isomers of C4H8O when reacts with CH3MgBr followed by acidification to alcohol (only consider carbonyl isomers and Including stereoisomers)? 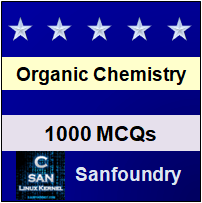 To practice tough questions and answers on all areas of Organic Chemistry, here is complete set of 1000+ Multiple Choice Questions and Answers.